BURBANK, Calif. June 8, 2009 – In 2008 audiences around the globe re-discovered and fell in love with one of the world's most iconic characters, as Walt Disney Pictures launched the breathtaking origin story of a beloved character in the fantastic all-new animated adventure -- Tinker Bell, the debut film in the exciting new "Disney Fairies" movie series. The delightful tale thrilled audiences of all ages, soaring to reach the year's number one spot as the biggest Direct- To-DVD release of 2008. * Releasing on October 27, 2009, the enchanting pixie-dusted tale continues in an even more action-packed adventure, as Tinker Bell and the Lost Treasure delightfully expands the world of fairies and takes Tink far beyond Pixie Hollow in an original full- length CG animated film that flies to Blu-ray ("Combo Pack" Blu-ray +DVD) and standard def DVD. In the original Tinker Bell, for the first time ever, fans heard Tink's voice, met her fabulous fairy friends, got a glimpse into the world of Pixie Hollow and learned about her true origins and the unexplainable, mystical wonders of nature. Produced by DisneyToon Studios, Tinker Bell and the Lost Treasure is the highly anticipated second film in the continuing Disney Fairies Franchise and a captivating story that continues the overwhelmingly popular adventures through breathtaking animation, spectacular music and an all-star cast of voice talents. In Tinker Bell and the Lost Treasure Tinker Bell's greatest adventure yet takes place in Autumn, as the fairies are on the mainland changing the colors of the leaves, tending to pumpkin patches, and helping geese fly south for the winter. The rare Blue Moon will rise, and when its light passes through the magical Fall Scepter that Tinker Bell has been summoned to create, Pixie Hollow's supply of pixie dust will be restored. But when Tinker Bell accidentally puts all of Pixie Hollow in jeopardy, she must venture out across the sea on a secret quest to set things right. Along her journey Tink meets new friends, including Blaze, a cute and courageous firefly that helps Tinker Bell complete her mission. It's a long and dangerous journey, full of astonishing encounters, a few narrow escapes and a daring rescue by Tink's friend Terence. Tinker Bell and the Lost Treasure is an exciting adventure and a once-in-a-blue-moon experience for the entire family. It's Harvest Time in Pixie Hollow! Tinker Bell returns this fall in a brand new adventure! Take a look and post the first 6 minutes of Tinker Bell and the Lost Treasure ! Queen Clarion�s fairies are all aflutter with the preparations for autumn. Tink�s got a new mission- create the Fall Scepter to hold the Pixie Hollow Moonstone- and some helpful new pals. The first 6 minutes of Tinker Bell and the Lost Treasure ! The Disney Fairies is the latest franchise from The Walt Disney Company and has become one of the company's most successful franchises--driven on multiple platforms and across several business units of The Walt Disney Company, including Disney Consumer Products, Parks and Resorts, Disney Interactive Media Group, and Disney Channel. The Disney Fairies films are based on a series of books released beginning 2005 by Disney Publishing Worldwide, with more than 18+ million books sold to date. The series includes 10 Chapter Book titles reaching the New York times best-sellers list in the US with many reaching international best-sellers list and Disney Fairies magazines selling 7.5 million copies in 28 countries. The Consumer Products line, encompassing a wide assortment of categories including apparel, toys, role play, stationery, personal care, home décor, and youth electronics has been a huge success at retailers around the world, driving more than $850 MM in global retail sales. The story of Tinker Bell comes to life in the spectacular production of Disney On Ice presents Worlds of Fantasy. Currently in the second year of its US tour, this Disney On Ice show reveals the mystical world of Pixie Hollow and the arrival of Tinker Bell, as well as three other classic Disney stories: Disney/Pixar's Cars, The Lion King and The Little Mermaid. Disney Online recently introduced Disney Fairies Pixie Hollow (www.PixieHollow.com), an online destination where fans can experience the wonder and magic of Tinker Bell's world. In Pixie Hollow, guests can create their very own personalized Fairy and help bring about the change of seasons by making friends, playing games and embarking on quests. To date, more than 16 million Fairies have been created. Slated for release the same day as Tinker Bell and the Lost Treasure, Disney Fairies: Tinker Bell and the Lost Treasure for Nintendo DS from Disney Interactive Studios follows last year's release of Disney Fairies: Tinker Bell for Nintendo DS. According to NPD data, Disney Fairies: Tinker Bell continuously ranked in the top five adventure genre DS games from October – December of 2008.The new video game mirrors the upcoming movie's storyline and also lets players create and customize up to five of their own Fairies. The game also allows players to experience new levels of integration with the PixieHollow.com virtual world from Disney Online, including the ability to upload a Fairy avatar and various gatherables from the DS game to the virtual world. Both the Blu-ray and DVD have magical bonus features including animated "scenes you never saw," a guide to Pixie Hollow, and much more, offering viewers an extraordinary trip deep inside the enchanted world of Pixie Hollow. the autumn area of Pixie Hollow. by Director Klay Hall and Producer Sean Lurie. About Walt Disney Studios Home Entertainment Walt Disney Home Entertainment is distributed by Walt Disney Studios Worldwide Home Entertainment, Inc., a recognized industry leader. Walt Disney Studios Worldwide Home Entertainment is the marketing, sales and distribution company for Walt Disney, Touchstone, Hollywood Pictures, Miramax, and Buena Vista DVDs and Blu-rays. About Disney Fairies Disney Fairies is rooted in Disney's rich heritage of children's storytelling. The franchise builds upon the enormous popularity of Tinker Bell and introduces girls to her secret, magical world and a new circle of enchanting fairy friends – Fawn, Iridessa, Rosetta and Silvermist – each with an incredibly diverse talent, personality and look. Launched just a few years ago, the $850 million franchise boasts a thriving publishing and lifestyle merchandising program. To date, over 575 Disney Fairies books and over 125 Tinker Bell movie books have published worldwide in 60 countries and 35 languages, selling nearly 18 million copies; Disney Fairies magazines have sold over 7.5 million copies in 28 countries and an array of products from apparel and toys to electronics, home décor and stationery has extended storylines into many girls' homes across the globe. DisneyFairies.com is now available in more than 20 territories across North America, Latin America, EMEA and Asia Pacific. Fans have created more than 17 million personalized Fairy avatars to date that can now take flight in the virtual world of Pixie Hollow. Disney theme parks have also launched a Pixie Hollow attraction where fans can meet the Disney Fairies. The Disney Fairies are highlighted in the production of Disney On Ice presents Worlds of Fantasy, and additionally, Tinker Bell is in four other Disney On Ice shows touring the world. 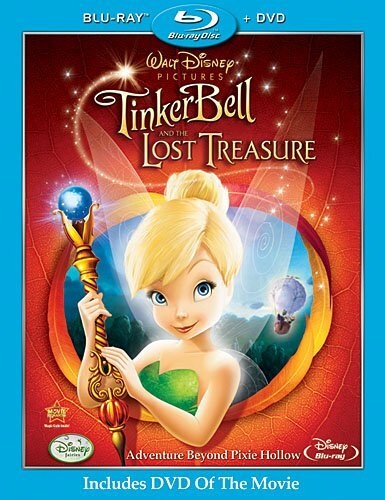 Following the success of Walt Disney Pictures Tinker Bell on Disney Blu-ray and hi-def DVD, Disney will release Tinker Bell and the Lost Treasure this fall as the second title in the series. ©Walt Disney Studios Home Entertainment, Inc.